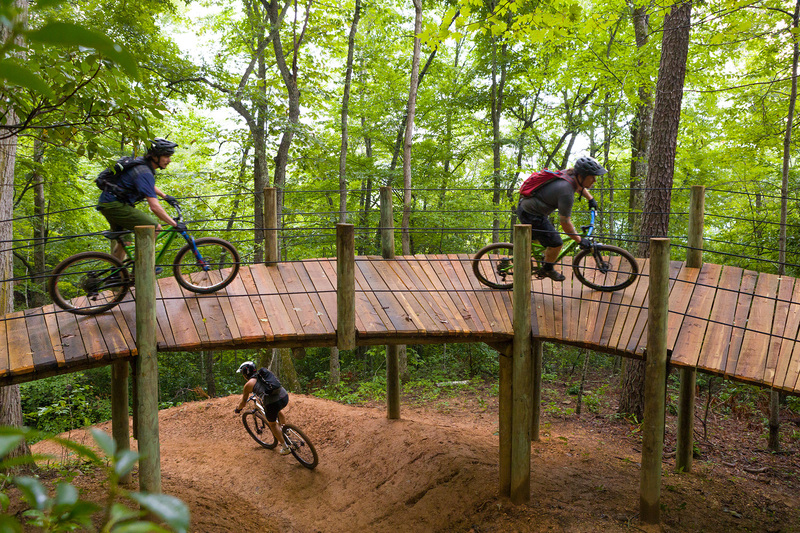 Fire Mountain, Cherokee, N.C.’s newest place for adrenaline-pumping adventure in the heart of the Qualla Boundary, is a multi-use trail system that is any mountain biker’s dream come true. Spanning more than 10.5 miles total, the trails have a nice flow of features with surprises around every turn. The trails offer fun berms, 20+ switchbacks in a single run and quick hits of elevation that are manageable and fun. You may even spot some wildlife along the way. Download the trail map. Fire Mountain Trails offer countless opportunities for adventure for participants of all skills. There are single-track and wider sections, spots that are smooth and fast, and trails that welcome the more technically accomplished. Located about 100 yards from the Oconaluftee Indian Village in Cherokee, the trails interlace through the nearby Great Smoky Mountains and is only a 20-minute drive from neighboring Sylva. These views are guaranteed to take your breath away! Free and open all day, every day, the trails will be waiting for your arrival.